It's kind of a slack week for new movies on DVDs; what we do have are some interesting items on the TV-on-DVD shelves. 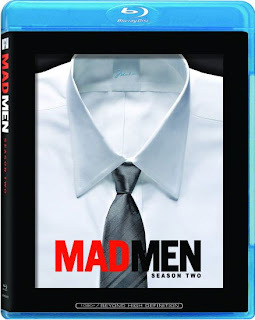 Mad Men- Season 2: I haven't had a chance yet to check out the Blu-ray release of season two, but I watched the first season on Blu (over the course of about a week and a half) and the glistening production design is just mind-blowing in HD. I watched the second season as it aired on AMC this season (in lousy standard-def, boo) and this show keeps getting better; it's smart, unpredictable television for grown-ups and continues to highlight some great writing and acting (even if the final episode wasn't quite as strong as the unforgettable first season closer). Adam Tyner over at the 'Talk gives season two high marks on Blu. The State- The Complete Series: Here's a show that I totally missed when it originally aired, but it has become legendary in the years since; countless members of its cast and crew have gone on to tremendous success and ubiquity in today's alt-comedy scene. So I'll be blind-buying this one, based primarily on my love of Wet Hot American Summerand Francis Rizzo III's five-star review at DVD Talk.